This fun little breaker features donuts(doughnuts). 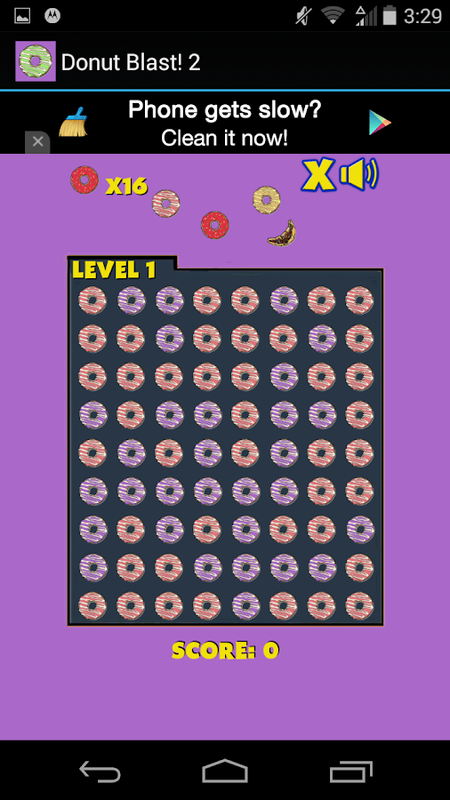 You must match the donuts up to clear each level. Youonly have 16 lives to complete all the levels, so use strategy.It's more than just popping the donuts to get them out of theway. Guess the Horror FREE! Is a guessing game in which you either getto guess the horror movie, or guess the horror movie character.Each picture is shadowed so it is harder to guess what movie orcharacter is from. Right now there are 168 levels with more tocome! If you absolutely can’t guess the scary movie, or guess thescary movie character then you have coins you can use. The coinscan be used to purchase hints, take letters away, or even solve thepuzzle. You can earn coins by solving each shadow picture in thequiz. You can obtain coins for free every 48 hours or if you chooseyou can purchase them in app. So get guessing the horror movie orguessing the horror character in this ultimate fun guess the shadowgame! Download for FREE today! 20 More levels added! 10/6/15 20More levels added! 10/12/15 20 More levels added! 10/19/15 20 Morelevels added! 10/27/15 20 More levels added! 12/21/15 20 Morelevels added! 2/1/16 more coming soon!!! Guess the character shadow is 228 Levels of character shadowguessing fun! Can you guess the character from, TV shows, movies,cartoons, and comics to move to the next level? This is mainly aguess the cartoon game, but features human characters too. If youlove character trivia games this one is for you! You will be givencoins if you can guess the character, which you can use to buy hintletters, take away letters, and reveal who the character is if youjust can't guess the correct answer. More levels will be addedsoon! So you can continue this fun guess the shadow quiz!!! Goodluck and have fun with this free guess the pic game! UPDATED with20 more levels in our guess the shadow cartoon from the 80’s packPart 1! UPDATED With 20 more new levels on Sept. 22nd 2015 in ourguess the character cartoon from the 80’s pack Part 2! UPDATED With20 more new levels on December 3rd 2015 in our Star Wars characterpack! UPDATED with 20 more new levels on December 15th 2015 in ourChristmas character pack! UPDATED with 20 more new levels onDecember 17th 2015 in our Marvel Heroes character pack! UPDATEDwith 20 more new levels on January 17th 2016 in our DC Comiccharacter pack! UPDATED with 20 more new levels on January 25th2016 in our Horror character pack! UPDATED with 20 more new levelson January 25th 2016 in our Disney character pack! UPDATED with 20more new levels on February 8th 2016 in our Video Game characterpack! More guess the shadow game fun coming soon! Flappy Emoji Extreme! Is a flappy style emojigame. Welcome to Emoji Land. That little place in your phone wherethe emoji's hide. Little did you know that when an emoji isselected for a text it must overcome a series of obstacles! Todayyou will be the person piloting the little psycho emoji past allthe obstacles! I know how joyous this must be for you! Downloadthis free emoticon game today! Your emoji awaits! TV Show Quiz Game is a fun Television trivia word game. This isn’tyour average TV show logo quiz because it uses shadows. Simplyguess the TV show of the shadowed image and move on to the nextlevel. The pictures can be from any television show including TVsitcoms, dramas, horror, cartoons, etc. They can also be from anytime period from the 50's, 60’s, 70’s, 80’s, 90’s TV shows tocurrent ones. You earn coins for each correct answer and they canbe used to expose a letter, or take away a letter and even give youthe answer if you are stuck. You can even ask Facebook for help ifyou simply can’t move on. Share this with family and friends andsee if they can guess the shadowed image. Even play at a party!This game is from the makers of Guess the Character Shadow, Guessthe Horror Free, Guess the Image: For Free, and other TV and movietrivia games! If you are a TV fan then this free TV trivia quiz isfor you! Additional level packs will be added soon! Added 18 morelevels March 7, 2016. Added 20 more levels May 25, 2016. Warm your brain up with 200 odd triviaquestions! We will add more questions in future updates or laterversions of the app. Try your hand at a single player trivia gameor test your family and friends knowledge of the strange andunusual today!Features include 200 random trivia questions, fun trivia gamefor the car, expand your trivia knowledge, some trivia questionsare educational and others are pop culture related.So what are you waiting for? Download this free trivia gametoday! Of all cat and dog games out there this one will let you exerciseyour memory! Simply match like pictures of cats and dogs. Try to doit with as few clicks as possible. Reach for a high score. Downloadthis free cute dog and cat game today! A fun memory game including 4 themes. Thethemes are icons, emoticons, bugs and monsters. All themes are fromour other game titles including IconoPop!, Emoticon Blast!,BeetleZap!, and Wutizit Breaker. Hours of fun for kids or adults.Test your memory and see how many you can match in this fununique memory game for free! Crush the donut by your finger, and enjoydonut splash! Donuts Crush Legend is a very addictive splash andmost interesting match-three casual game in the google play! Thismatch-3 game is also a brand new amazing casual game, completelyfree!! Objectives differ in over many levels. 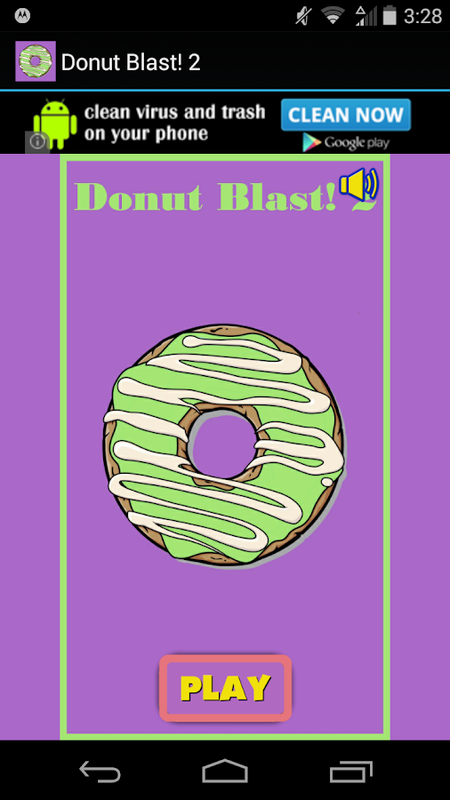 Make matches of 3 ormore donuts, create donut blast! or slide combination 3 or moresame donuts to make a juicy slicing! Starts out simple, but thingsget more and more interesting and challenging. Swiped donuts tomake the donut smash. This is a legend of donut puzzle and casualgame which is suitable for kids, toddlers, phone and tablet. Reachthe goal before the moves run out! Clear all donuts in same type,combo more than three same donuts to win a power-up donut to clearmore. Ready to enjoy donut jam now! Switch and match your waythrough hundreds of levels in this delicious puzzle adventure.Isn't it the sweetest game around?Take on this deliciously sweet donut games alone or play withfriends to see who can get the highest score!☆ Donut Crush Match 3 is the beautiful and juicy game in Match 3style. Combine 3 or more objects the same color for WIN and makethe lands become donut paradise!☆ Play donut mania With Your Friends & Family! Join the fun newcandy matching game all your friends are playing!☆ Beautiful animation & cute graphic, travel through thecolorful lands of donut clash mania to relax with excitinggame-play and amazing level design. Help the people you meet have ahappy donut!☆ 2016's best new match-3 game! Play this cool free match-3 candygame and watch the hours fly by!☆ Beware the donut frenzy witch! Avoid the evil witch! Make bigdonut matches to sugar crush and send her running!+++ Features +++- Tons of donut king levels!- Brand new power-ups and ways to play!- Huge awesome explosions as donut smash sugar mania to bits,splashing donut goo everywhere!- Make combo, collect yummy cakes to make the kingdom become donutparadise- Donut magic boosters: donut boom, donut pop, colorful sugar,sugar blast switch- Tasty colorful graphics with soda donuts- Visual and Sounds effects- Five game obstacles (Block/Double block, Solid block,Undestroyable block, Wire Block, Thriving block)- Stripe item destroys all game objects its way- Multicolor bomb destroys all items the same color which has beencombined- Stripe items, package and colorful bomb bonuses- We will add more levels & update gameplay regularly+++ HOW TO PLAY? +++- Crush to smash 3 or more soda donuts- Smash 4 soda donuts in a line to create sugar blast line or donutboom- Smash 5 soda donuts in a line to create donut pop - colorfulsugar- Combine 2 special donuts to make a big donut pop JAM!+++ BOOSTERS +++- Extra donut splash: Give +5 extra moves- donut hop: Give +5 extra steps- donut Boom: Destroying 1 item on game field- donut Pop: get a yummy donut, multicolor bomb on the playingfield at the start of the game- Colorful Sugar: crush & jam all yummy cakes have samecolor- Sugar Blast Line: crush & jam all yummy cakes on the puzzlerow- Super Sugar Blast: crush & jam all yummy cakes both row &line- Go to Bakery Shop to buy boostersPlay donut hop to make your way to dozens of colorful lands!This cool free match-3 candy game and watch the hours fly by! Matchand Switch 3, 4, 5 and more donuts in the most colourful puzzlegame you'll ever play. Collect delicious Soda donut to reach targetscore !PLAY for FREE ! EASY TO PLAY but HARD TO MASTER !ENJOY!